Not sure where to start? You’ve come to the right place! Have you been given a research paper or writing assignment? Not sure how to begin? Don't worry, we can point you in the right direction! We can show you how to find academically appropriate material to use in your research assignments without having to sort through the huge amounts of information you might find on the internet. 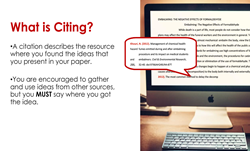 We can also help you with citing sources using APA and MLA. Ask Us! using the chat box on the right to get started on your research or writing assignment. Email the library, call (780) 644-6070, or drop in. Attend a workshop. The library and Writing Centre offer workshops throughout the year to help you develop your reading, writing, and research skills. Your instructor can request a library instruction session related to your assignment. Our online tutorials can provide you with tips for doing research. Check out our Research Guides. 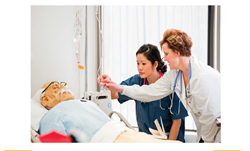 They relate to specific programs, courses and subjects, and are full of great information! Our library tutorials have been designed so you can learn on your own, at your own pace, when it's convenient for you. Learn how to use Academic Writer to assist you with writing essays and citing in APA Format. 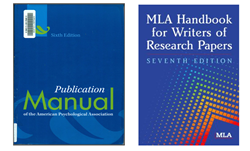 Tutorials are available from Academic Writer (formerly APA Style Central) via YouTube. An in-depth tutorial on how to use APA for written assignments. Includes sections on document formatting, reference citations, and in-text citations. This tutorial is equivalent to our in-class APA workshops. It is intended for distance learners, or students who missed the in-person workshop. Students who have taken the APA workshop may find the tutorial useful for review. 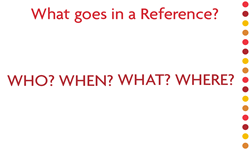 What goes in an APA reference citation? Learn the basic components of an APA reference list entry. 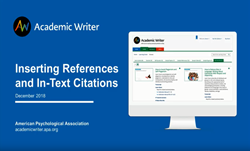 Learn how to create in-text citations in APA format for a variety of different sources. This tutorial explains how to find keywords in your topic, and why they are important for finding relevant resources. 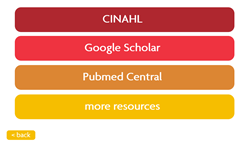 This tutorial demonstrates how to find the CINAHL database, and use it to retrieve scholarly articles in nursing and healthcare. Learn about the library services available to distance, regional and online students. This includes how to access online resources, and how to make an online appointment with a tutor or librarian. eBooks are available online 24/7! 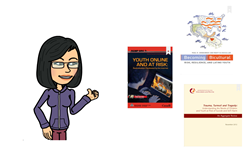 Learn how to find and use these great convenient resources. Proquest Ebook Central is the company which provides NorQuest Library with eBooks. Learn how to make an account in order to access advanced features such as downloading eBooks. Learn how to print, bookmark, copy and cite (and more!) your eBooks using the advanced features in eBook Central. 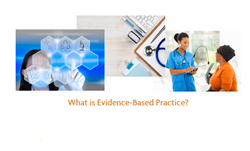 Learn about evidence-informed practice, and why it is important for healthcare decision-making. Learn how to find evidence-informed research sources. 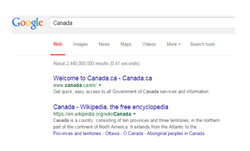 Learn tips for using Google more efficiently. 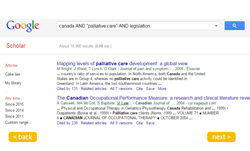 Learn how to use Google Scholar to find reliable, scholarly resources on the web. Find information on complications for various diseases and injuries using these recommended tools. 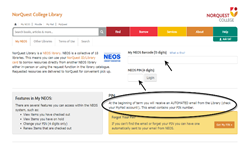 Instructions for how to log-in to OneSearch and your NEOS account from off campus locations. This tutorial demonstrates the basics of a library database search, including how to access the database and how to add limiters to search results. 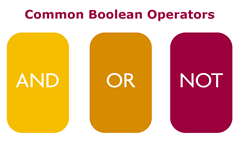 Use the Boolean Operators AND, OR, & NOT to create a more efficient database search. 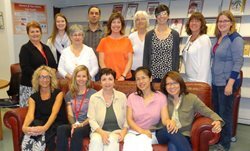 An orientation to the services offered by the NorQuest College Library. 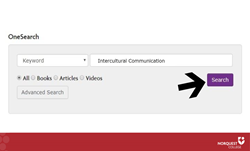 This tutorial demonstrates how to find a books, articles, videos, and more using the library's search tool OneSearch. This tutorial describes the characteristics of peer-reviewed articles, and how to easily find them in the library databases. 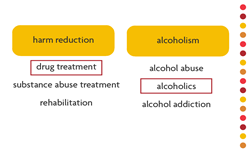 What are MLA & APA? Find out what MLA & APA are, and what types of rules they use. This video describes what databases are and why they are valuable resources for your research. 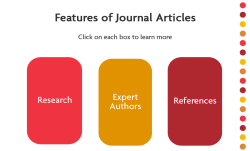 This tutorial discusses the features of journal articles. We provide customized, assignment-specific library instruction to develop the research and information literacy skills of students. Instruction can be provided in your classroom, a computer lab or in the library. Please note: If you are a regional, online/distance, or eCampus Alberta student and you cannot meet us in person, let us know. We can make arrangements to meet you over the phone or online! You can return any NEOS item (book, DVD, audio book, etc.) borrowed from any NEOS library to any NEOS library. At the Downtown Campus you can return any NEOS item (book, DVD, audio book, etc.) to the Library service desk on the 2nd floor of the Singhmar Centre for Learning or, after hours, to the return bin located outside the Library doors. At Westmount Campus, NEOS items can be returned directly to the library. Materials returned to a bin will be back dated to reflect the previous business day. Materials can also be returned directly and in person to the circulation desk. Regional and distance students (those residing outside Edmonton) can return materials by mail (self-addressed and postage paid envelope is included with all distance loans). Where is there a quiet place to study? The Learner Centre has a 32 seat quiet study located in the Learner Centre on the 2nd floor of the Singhmar Centre for Learning at the Edmonton Downtown Campus. 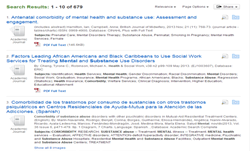 Who can access the digital resources like articles, databases, streamed content and eBooks? 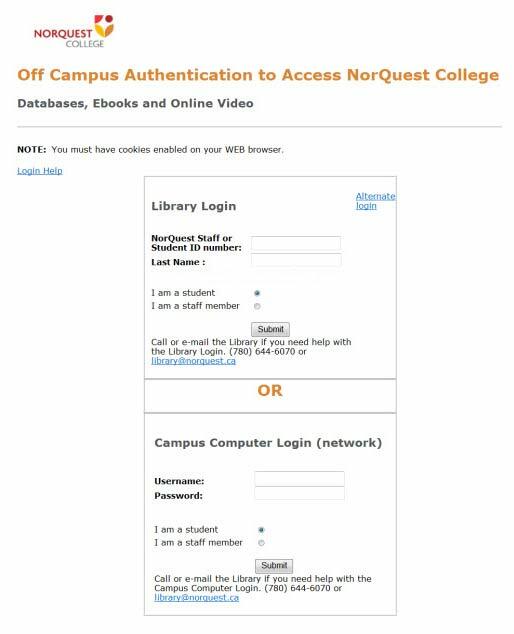 All students who are enrolled in classes at NorQuest College can access electronic articles, databases, streamed content and ebooks through the NorQuest Library website. All staff and faculty of NorQuest College can access electronic articles, databases, streamed content and ebooks through the NorQuest Library website. How do I login to access the articles, databases, streamed content and eBooks when I am not on campus? If you have a network username and password you can you that to authenticate by entering this information in the Computer Commons sign on. If you have never used a network username and password you can use a special library login; which is your 7 digit ID number and your last name by entering this information in the Library Login sign on. 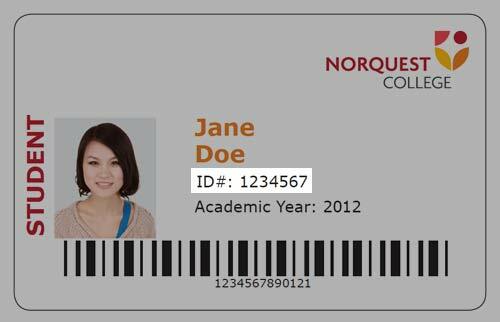 What is my NorQuest ID? What is the difference between high resolution and low resolution when I want to watch streamed or online video? We recommend low resolution if you are watching something on campus using a computer, tablet or phone. If you are showing the video in a classroom we recommend using high resolution. Where can I find the Learner Centre? The Learner Centre is located on the 2nd floor of the Singhmar Centre for Learning at the Edmonton Downtown Campus. Location and hours. Can we book a group working space? Yes. To book a collaborative work space/media room use our Room Booking tool. There are 16 student meeting rooms available for booking. What does the Find it! Logo mean? Some articles are not available in full-text. 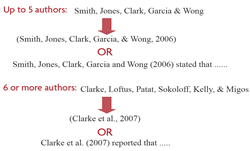 Some article databases merely "index" the article citation rather than supply the full PDF to the article. When this occurs you will see the Find It! Logo. When you open the Find It! logo, it tries to find the full text version of the article in another database that we subscribe to. To avoid this situation, select full-text only as part of your search strategy. How can I find a specific Journal title? Search or browse the Find It! 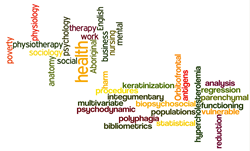 A-Z Journal List for NorQuest Library's full-text online journals. I am a distance student. What kind of library/research support is available to me? 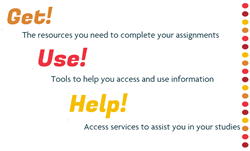 The NorQuest College Library offers a variety of resources and services to help you with your assignments and courses. To help you get the most out of your library, here is a poster which links to many useful library resources and services. Download a copy to your computer desktop for easy access. The images on the poster are clickable and link directly to relevant resources and information on the library website. We also have a Distance and Online Basics guide designed specifically to help you. In addition to our Ask Us! chat service, you may also book online appointments with a librarian via the Writing Centre. 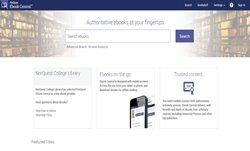 How do I access ebooks, online video, articles from the OneSearch (the library catalogue) when I am off-campus? Click on the "Hello Guest. Login for full access" link located in the yellow bar at the top of the search results page. Once you have logged in, you can click on the link in the results list to take you to the ebook, online video or article. Some databases encounter access problems when using older versions of Internet Explorer. We recommend using the current version of Internet Explorer or recent versions of Chrome or Firefox to access databases. There are known issues when accessing some of the databases, eBooks and online video via the staff VPN Access(SSO). To work around this problem, open a separate browser window and paste in the address of the database or link you wish to access. Videos may be choppy because of low bandwidth issues - starting, pausing and re-starting will buffer the video so that you can play it. When encountering difficulties accessing a database or online video, try using a different browser. For example if you are using Internet Explorer, try using Chrome or Firefox. Sometimes the settings in one browser will prevent the resource from displaying while another browser works fine. When you use Google Chrome (version 42.0 or later) to access our Criterion on Demand videos, you will see a message that you need to install Microsoft Silverlight, even if it is already installed. According to MicroSoft Support this is because Chrome no longer supports the Silverlight plugin. We recommend copying the link into a different browser such as Internet Explorer, Firefox or Safari to view the video. download and use the Google Chrome browser instead of Safari to view the videos. For iPad users, try using the Puffin browser to view the videos. Chat: What is the Ask Us! chat service? Chat is a way to ask library staff quick questions (less than 15 minutes) in real time. For more indepth or extended questions please Book an Appointment through the Writing Centre. Chat is intended for use by NorQuest College students and staff. Chat: How does the Ask Us! chat service work? Type your question into the chat box. Do not include any personal information such as your name or ID number. The librarian will be notified that a chat question is waiting. 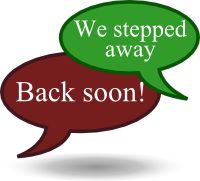 Please be patient as it may take a few minutes for the librarian to respond, especially if they are working with another student. As you chat, keep in mind that it may take a few minutes for the librarian to respond. The librarian may need time to assess your question, locate online sources, and compose a response. While you wait, you can continue to use other programs on your computer or use another browser window connected to the Internet. If you navigate away from the page during your conversation, the connection will be lost. To avoid losing the conversation, open the chat box in a new window by clicking on the green arrow. Or open a new browser window or tab to follow along with suggestions the librarian makes. Chat: Can you provide my login information via Chat? Librarians are unable to provide you with your login information or pin over the chat service, please call the library at 780-644-6070 for assistance. Please do not include your personal information in your question. Chat: What are chat transcripts? As you chat, a transcript of the session is recorded and stored securely on the chat provider's server. You may click on the email icon and have a transcript sent to your email address. Access to stored transcripts is restricted to authorized library staff. Chat transcripts are used periodically to evaluate the quality of this service and for statistical purposes. Chat: What kind of help can I receive through Chat? In addition to helping you locate library resources, including books, articles, videos and digital resources, librarians can help you find appropriate sources for your assignment, answer citation questions (APA, MLA), and provide explanation about library services and procedures. Chat: When is chat available? Hours of service are Monday-Friday 8-5. Limited service may be available when the library is open during evenings and Saturdays.